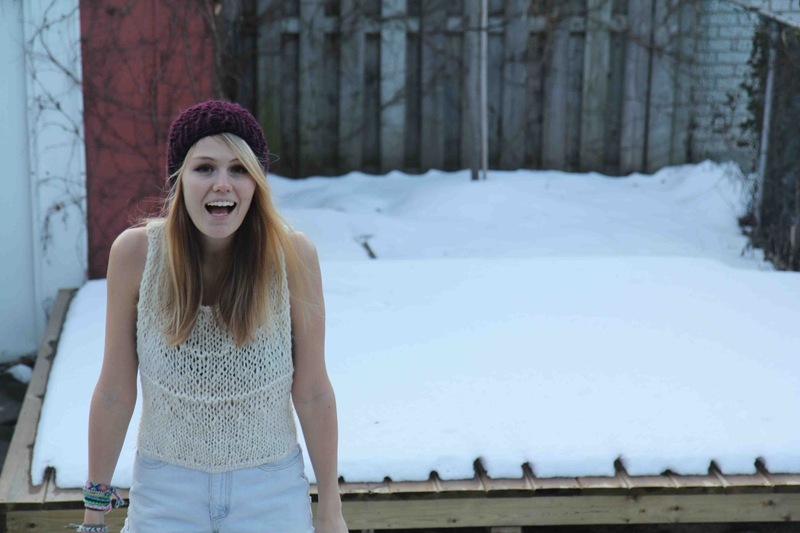 On February 9th from 1-3 18th from 6:30-8:30 I'll be teaching a beginner's knitting course in Toronto! It's part of Etsy's Craftathon week, I'll be teaching the basics and hopefully everyone will complete a headband! It's a really easy project and I think it will be great. It's $25 and that includes a beginner's knitting kit!!! I've looked at what other places charge and this is a really good deal considering the kit is included in the price. To sign up click here for more details. The winner of the awesome fingerless gloves knitting kit is Sapphirepill from instagram! Thank you to everyone who entered both on Instagram and through my blog!!! You guys are the best! Hosting my first giveaway was a lot of fun and hopefully I'll be able to do it again sometime! Once again I received a really great response from instagram about this top! Thank you all so much for your awesome comments and positivity :) It makes me excited to create more! I used to just knit without even taking photos and would just slowly show my friends. Having a great knitting community on my phone is awesome for inspiration as I love to see what people are making and it makes me want to share what I'm doing too! Ravelry and Kollabora are great as well obviously. Ok SO! Here is the pattern for my Two-Toned T! I'm really happy about how it turned out and the fit! It's probably my best fitted knit top. This pattern is fairly easy, you only need to know how to knit and purl, but it can be tricky when going from knitting on the round to knitting back to straight needles. You can do it!! I wear a size small and it's a bit stretchy so this would probably fit s/m. It actually would also fit a Large because of the stretchy material but if you're worried just add a few stitches when casting on and it should be fine. - With size 8 needles cast on 70 stitches and attach in the round (be careful not to twist stitches!! I did this my first time casting this project on and had to take it all out after 5 rows when I noticed). Work in a rib of Knit 1, Purl 1 for the row. Keep ribbing in this manner for 5 rows. - Change to size 15 needles, decrease 1 stitch every 10 stitches by knitting two together. this is how your shirt should look after you're done one side! Notice how I added the 10 stitches to either side to make the T shaped Sleeves. Now go out and show off your awesome new top!!! knock out gloves with studs! Earlier this week Kollabora sent me an awesome fingerless gloves kit (to win your own enter here!) They were SO EASY and really quick too! Perfect for knitters of all levels, here is the pattern. Since they were so easy I thought I would spruce them up with some ~*bLiNg*~ ok not really bling just a few studs that I got at Arton Beads on Queen near Spadina in Toronto. I bought $40 worth of studs!!! Not just for this project but for projects in the future. It's $3.50 for a pack and you get probably over 50 studs in there!! Anyway they're really easy to use, if you don't have pliers just use the back of a pair of scissors to hammer down the sides. Here is what I did! Follow the pattern posted from the link above. Now you have a pair of fingerless gloves! Add the studs one at a time, spacing them out evenly along the way. You should now have something that looks like this! yay! I'm wearing neon pink nail polish but you can't really tell in this photo, it looks cool I swear! woot! Now go outside and show off your sweet new gloves! I'm happy to announce that I'm running a GIVEAWAY! You can enter on here or on instagram. To enter just comment below! (or repost on instagram and tag me) Winner will be chosen on January 20th! Up for grabs is a fingerless gloves kit; awesome lions brand yarn, size 13 needles, and some great 'we are what we make' pins and stickers. Good luck everyone!! 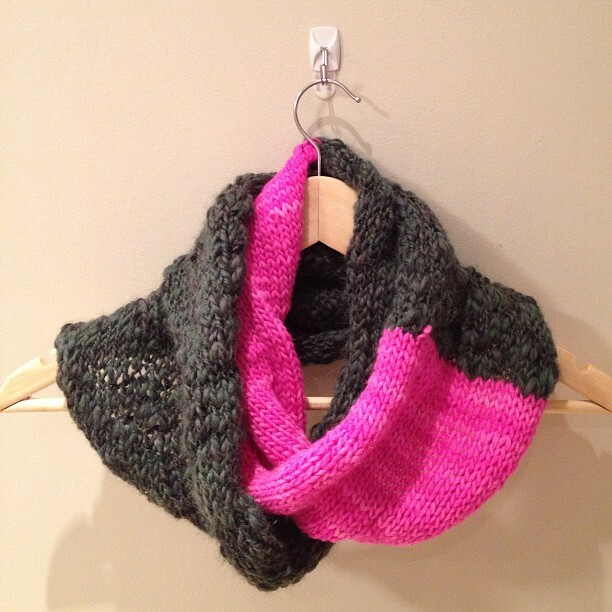 I received a really great positive response to my army green/neon pink scarf on instagram! I really love it! As I said, it's a perfect spring scarf, I wouldn't wear it on the coldest days though because it's not thick enough and I get cold VERY easily. But it's really cool looking and I love the mix of the grungy army green with the feminin and crazy neon pink. Right now I'm making a grey/neon yellow tshirt, with the same chunky hunk and merino yarns! I'm excited to see how it turns out. My favourite way to knit is by freestyle knitting; knitting without any 'real' plan or pattern in mind. It's how I turned a scarf into my beloved highlighter halter top. As I've said before, I really don't like following patterns because there are so many things that you have to do (make a swatch, have the proper needle and yarn sizes, etc). I used to look at patterns for reference and now I use other items that I've knit for reference. Also I usually don't write down exactly what I've done and then people ask me how I made it and I have no clue! WELL this time I wrote everything down and I'm here to share that information with you!!! If you want to follow a pattern use this, or use it as a reference for creating your own masterpiece. I wear a size small so if you're bigger you might want to add stitches at the beginning. The front and back are essentially knit the same but the back has less stitches than the front (to stay flat on your back and the front has some extra room for lady-parts). Start with attaching the top - sew left and right shoulders together for front and back pieces using your tapestry needle; Sew about 1-1.5 inches for this part. Sew the sides together starting at the bottom about 2.5 inches on each side. Now go out and wear it while it's still cold outside! No just kidding wear some layers on top or underneath! I'll be wearing mine through till it's 30 degrees (celsius) out :). If you make this top (or a variation) please share with me I would LOVE to see it!!! A few years ago before I started Scarffaces, I made my dad a special neckwarmer that was knit on the outside and had a neon leopard print fleece lining. This took me a REALLY long time to make because the hand sewing was very tedious but I loved how it looked and felt. 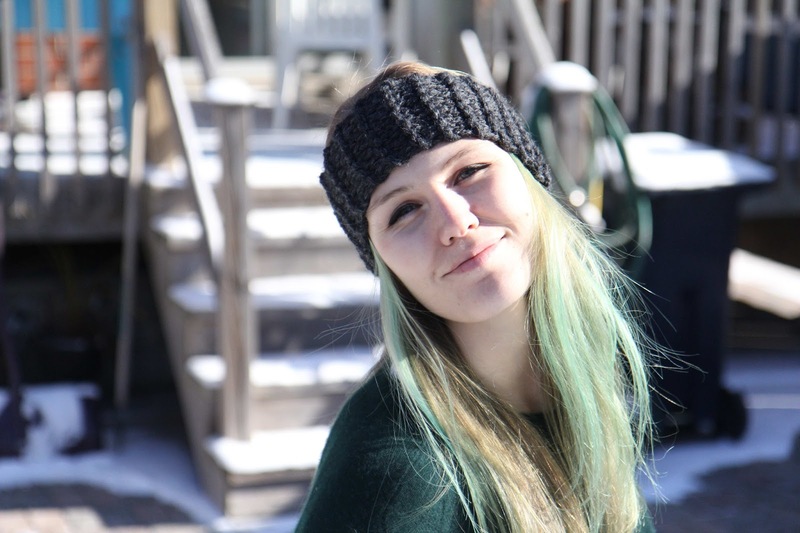 Earlier this year I thought about making some more neckwarmers but I wanted to cut down on my time, so I found a really quick and easy solution! What I've been doing is I wear the fleece neckwarmer that I already have had for years, and overtop I put my knit neckie! The result is a really really really warm face and neck :) and it looks cool. I love it so much! Plus it gives a nice versatility to the scarf - when I'm not skiing I can wear it without the extra fleece lining in the city for a regular warm scarf. The fleece lining is great for the wind while going up the chairlift, but wouldn't be ideal for a walk in the city. I'll try to take some better photos this weekend. I hope that everyone had a great holiday and happy new year!!! From Top: Ben in his Charcoal neckie, Dave in his Ma$e with secret pocket on the inside, and Meowold in his Meowold neckie and knit cat ears. 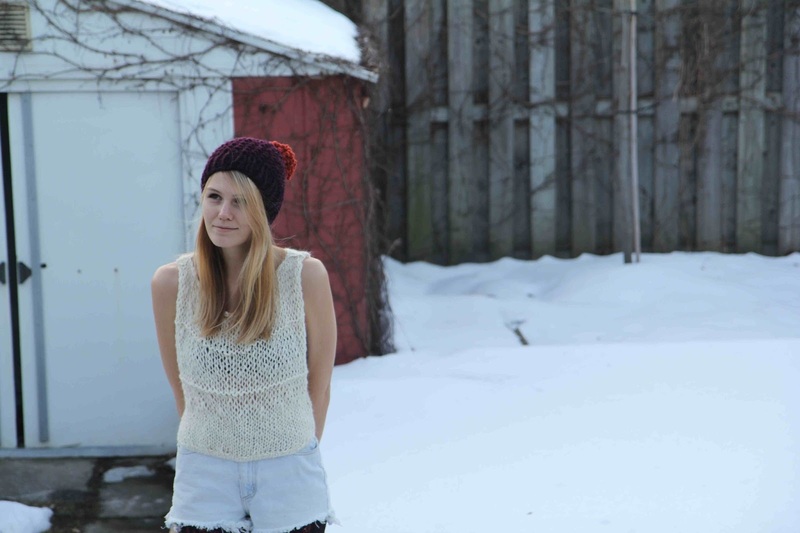 I love seeing people in my knits so if you have a photo please send it my way!!! For new years I had such a nice time with all of my friendlies it was so great and I know that 2013 will be an amazing year!